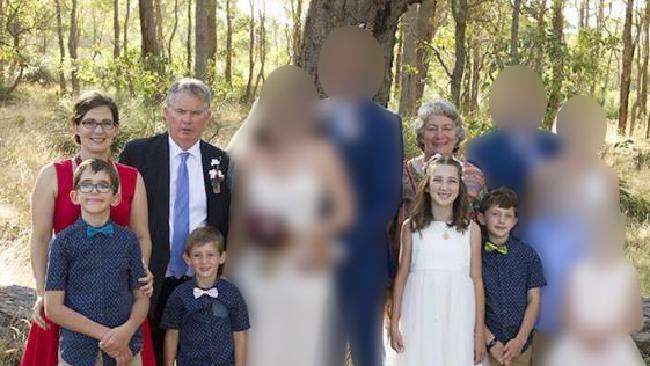 NEIGHBOURS of the West Australian family killed in the worst mass shooting since Port Arthur have scrutinised the final conversations they had with them, realising there may have been warning signs they missed. Police are trying to figure out why the main suspect Peter Miles may have shot and killed six of his family members before turning the gun on himself. There have been murmurs the 61-year-old grandfather was under financial stress and was struggling to find work, a narrative backed up by a number of Facebook appeals and Gumtree ads offering his farm expertise. 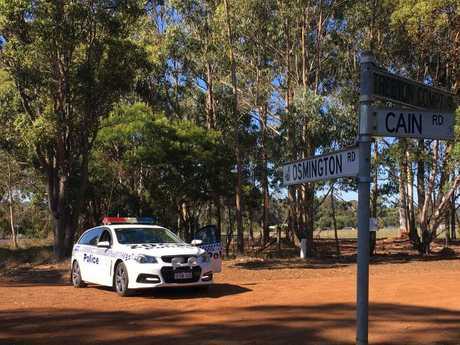 West Australian Police rushed to the rural property on Friday morning after a male attached to the Osmington home called triple-0. Officers from Margaret River police station found Katrina Miles dead in her bed with her eight-year-old boy Kadyn next to her. They also found Taye, 13, Rylan, 12 and Arye, 10 and the children's grandmother Cynda before finding her husband Peter slumped in a chair with a rifle between his legs. All seven died from gunshot wounds. The Miles family before last week’s shooting. Since the tragedy, conversations neighbours had with the family members in the days before the massacre have taken on new significance. 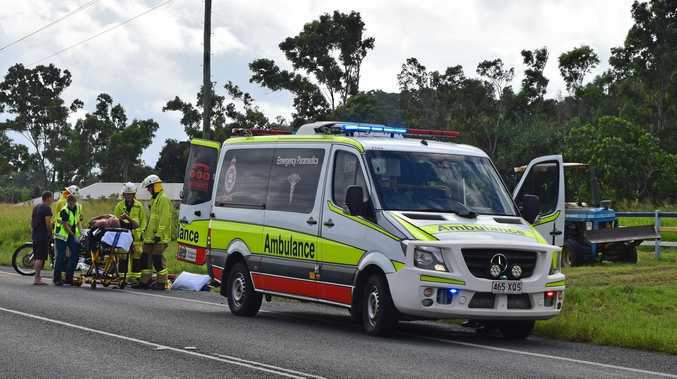 Felicity Haynes, a neighbour who lived close to the family's 3.5-acre property, told ABC's 7.30she'd noticed her close friend Cynda was "looking tired" last week. "I had spoken to Cynda just last week and I said, 'You are looking tired. Is everything OK?' She said to me then, 'There area few difficulties at home.' I didn't push. If she doesn't want to tell me, she doesn't want to tell me. But that was clearly Peter was becoming less rational and that was a worry to her," Ms Haynes told the ABC program. Another neighbour, Richard Dossor, said he called Mr Miles the day before the mass shooting to offer the 61-year-old a job. Mr Dossor said he "sounded strange" on the phone. "[He was] just not someone who I would have thought was keen to find a new client or customer," Mr Dossor told Seven News. "He didn't seem enthusiastic if you know what I mean?" he added. Ms Haynes mirrored the words of Aaron Cockman, Katrina's former partner and the father of their children, when she spoke about Mr Miles' struggle with depression. "I knew that Peter had been depressed for some time. 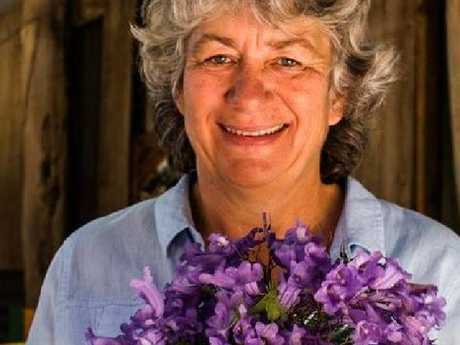 He's had a difficult life and there have been deaths in the family that really upset him," Ms Haynes told 7.30. Cynda was having ‘problems at home’ before the mass shooting. Addressing media on Sunday, Aaron Cockman said the Miles family had struggled when one of Peter and Cynda's sons took his own life 10 years ago. Another of the Miles children, Neil, is believed to be suffering from severe kidney problems. 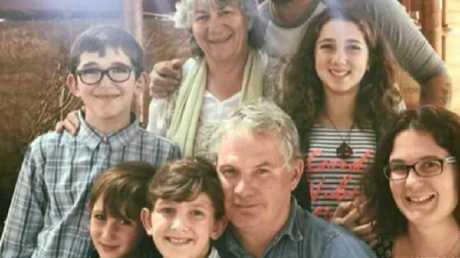 Despite the neighbours now voicing their concerns about the Miles family, none of them expected such a severe tragedy to occur in their tiny community of Osmington, a short drive from the idyllic Margaret River. "They all cared for each other, that was what made it so horrifying. Everyone says they are in shock, disbelief at such an event. It was unimaginable that one of them could come and destroy everyone else there," Ms Haynes said. Even when one of the residents living on Ms Haynes' property was woken at 4am to the sound of gunshots, no one's mind wandered to something as dark as the current reality. "I have a resident living on the property and she heard the shots at 4 in the morning. She thought it was roo shooters," Ms Haynes said. Neighbours Brent and Tahita Watson didn't bat an eyelid when they saw police cars in their tiny community - it wasn't until their mobile phone started ringing off the hook with people asking if they were all right that they thought something must be seriously wrong. "All I know is that I've had rifles all of my life and I guess again being rural it is just, it might as well be a screwdriver or something. It is just another tool and you don't think about any deeper implications than that," Mr Watson said. "I could imagine that he would be pretty attached to those kids and may have been worrying about their future or something. Maybe he found ... You know, maybe some perception of an irreconcilable mountain that he had to get over," he said. Police blocking the road near the family’s property in Osmington. While police and neighbours will never truly know what went on at the West Australian property, Ms Haynes said she wished her friend Cynda could've opened up to her. "If [Peter] could have talked to other people. If Cynda could have talked to other people. If only we had known and we could have offered to help," Ms Haynes said. West Australian Police have not confirmed Peter Miles is the person behind the mass shooting but have said the 61-year-old is a suspect. The state's police commissioner Chris Dawson has called for calm as officers and forensic teams continue their investigation. "We may never know the full story and the exact chronology of events. We have got to step through this very professionally and very carefully and not jump to conclusions," Mr Dawson said. In the lead-up to last week's tragedy, Mr Miles had been looking for work and a number of people in the Margaret River community have suggested financial hardship could have played a role in his decision. In a Gumtree ad posted two days before the shooting, Mr Miles said he "welcomed all inquiries" from people who might be able to give him work. A post from Cynda offering up her husband's work. 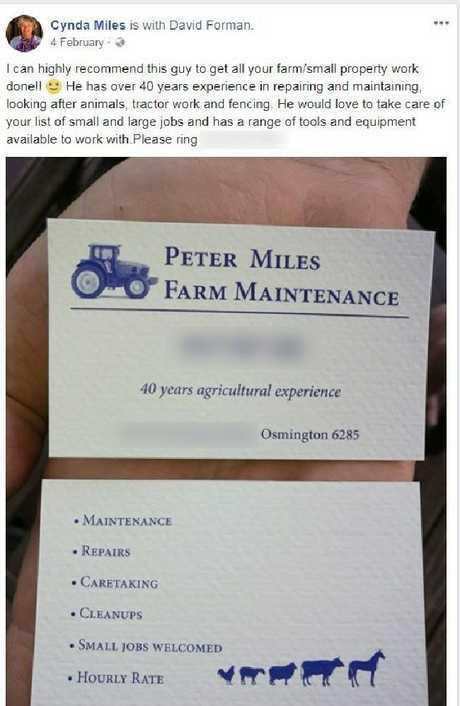 Mrs Miles' post was later shared by a Margaret River farming Facebook page with the caption: "Need a hand on your farm? Peter Miles is a legend."